Just in time for Canada Day, the Fraser Valley Poets Society launched their latest anthology, O Canada: Celebrating 150 Years. Society President Brayden Sawatzky opened the evening by welcoming us and reading his foreword to the book. Editor Alvin Ens and Associate Editor Violet Nesdoly described the 18-month process that brought the volume from idea to completion. Violet, Alvin, Terry, and Ted read poems from the anthology, and Robert Martens concluded the first part of the evening by reading a poem by Erin Fisher (who contributed to the book but died before the book was published). Thirty minutes slipped by quickly as we purchased books, nibbled on Canada Day goodies, shared conversation, or found a quiet corner to get acquainted with this latest joint endeavour. The last half of the evening was filled with O Canada contributors reading selections from the book. It was a thrill to hear our founder Donna Bishop read “Halkomelem: The people of the River; The People of the Land.” At 90+ she’s still going strong! We listened to poems as diverse as the description of a bad dream (“The Ice, the Sea and Me” – Shelley Haggard) to a tongue-in-cheek look at interesting Canadian community names (“Canada: This Place I Call Home’ – Brenda Firth). Alvin Ens also read several factoids—alerting us to another feature of the book—75+facts about Canadian history, Canadian literary history, and Fraser Valley Poets Society history sprinkled throughout. O Canada: Celebrating 150 Years is now available for purchase ($20). Want one? Contact T.W. Goodrich. The Fraser Valley Poets Society will now take a summer break. But plan to join us when we meet again on September 11, 2017 (6:30-8:30, Clearbrook Library, 32320 George Henderson Way, Abbotsford B.C.). Have a joyful Canada Day and a safe, happy, poetic summer! A Blue Moon reading and book launch were the features of FVPS’s first poetry night after the summer break, September 12th. Brayden Sawatzky, Erin Fisher and Michael Linburg, co-creators of the just published anthology Spirit Path began the evening by each reading selections from their segments of the book. 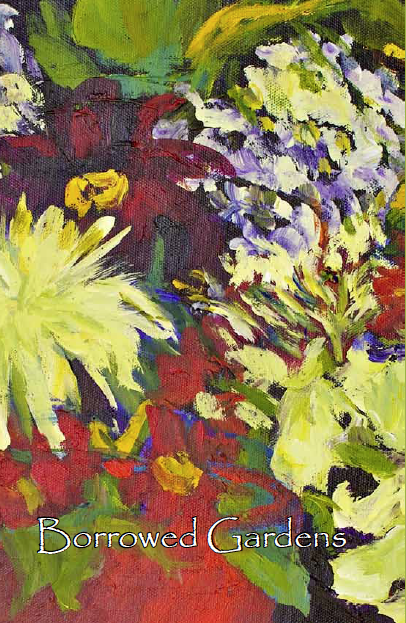 Brayden intrigued us all with four poems from his “Garden of Poets” section—21 poems that describe inspiration he has gained from the society and individual members of it. He supplements these poems with quotes from the Bible and other sources.What a gracious and affirming beginning to a book by three authors. dangerously close to devastation…” – from “Lightness of Being” – p. 61.
to verify its beauty?” – from “early words” p. 156. That it was me” – “from “Randomness,” p. 214. But it was his poem “I Am,” full of its hard-earned affirmations that will stick with me long past the evening. Well done, you three (and Alvin Ens, who got the book ready for the press)! This 266-page book sells for $20. Contact Brayden Sawatzky for details on how to get your own copy. 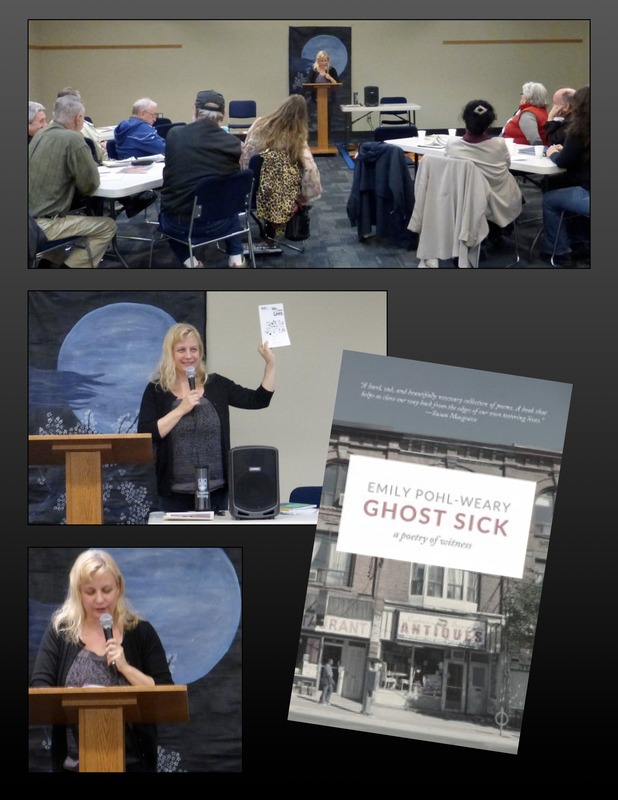 Thanks to all who came out to read and listen! Now mark your calendars for our next poetry night, Monday, October 3rd (6:30-8:30 p.m., Clearbrook Library, 32320 George Ferguson Way, Abbotsford, B.C.). It will be another Blue Moon Reading featuring Robert Martens reading from his most recent book Hush. An open mic will follow so come prepared to share something with us. Also, remember that the deadline for submitting to our 2017 anthology in honour of Canada’s 150th birthday is quickly approaching (October 15th). See all the details on the Home page. Open Mic begins National Poetry Month on the right foot! April is National Poetry Month. I hope you’re enjoying something poetic. Thank you to all that came out to listen or read their poetry at Monday’s Open Mic. What a delightful evening meeting new folks and greeting old friends. Thanks for the photo collages, Terry! Readers at the April 4 FVPS Open Mic. 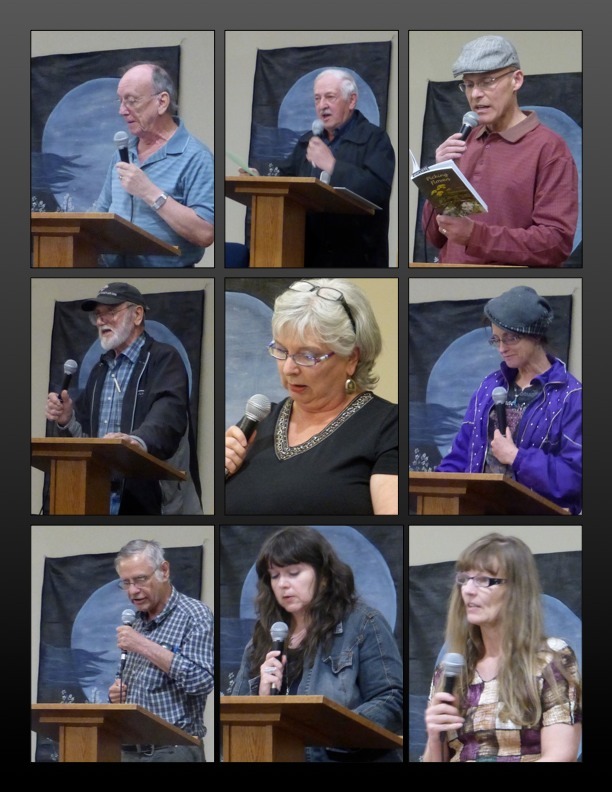 More readers and the audience – April 4, 2016 Open Mic. 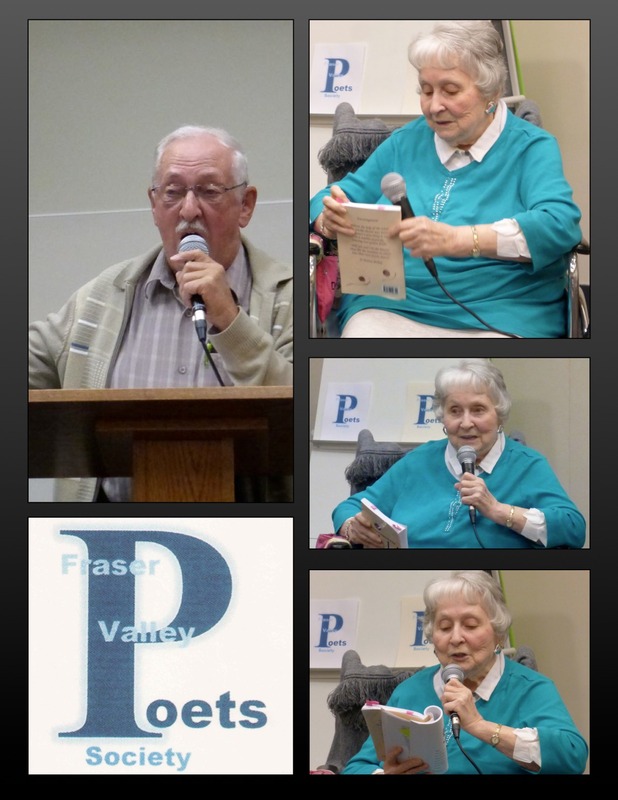 Fraser Valley Poets Society began their series of fall readings by unveiling their new logo and hosting an open mic poetry reading. Alvin Ens’s design (chosen from nine designs) is the winner! We’re proud of this new iteration of our name and will be placing it on our website, letterhead, brochures etc. We spent the remainder of the evening reading and listening to poetry (and a little prose). A special treat was the presence of our founder, Donna Bishop. This almost 91-year-old read from Encouragement, the book of her writings published by FVPS a year ago. Thanks to all readers (old and new, a total of ten) who entertained us with their readings and one poem recited by memory! Left: Alvin Ens, and the winning design in the logo contest. Right: FVPS founder Donna Bishop reads from Encouragement. Last spring reading launches another book! 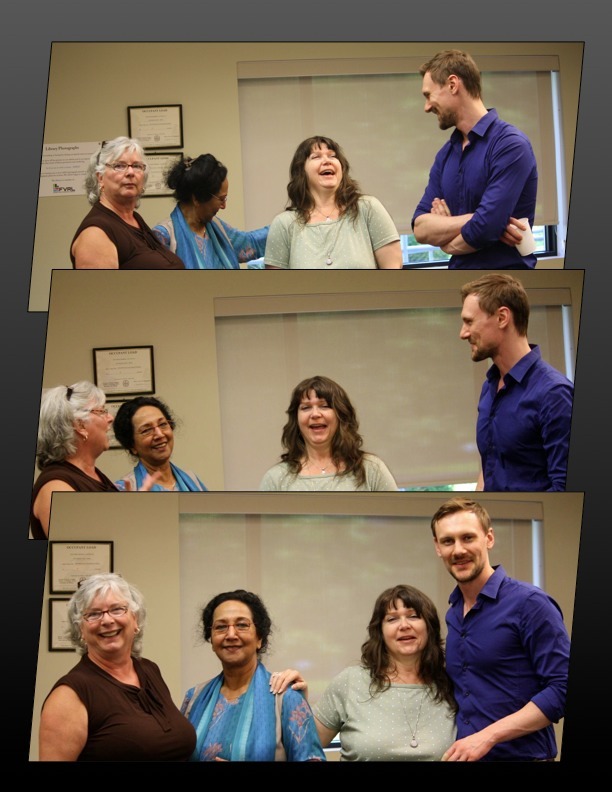 An excellent and happy meeting of the Fraser Valley Poets Society took place on June 15th. 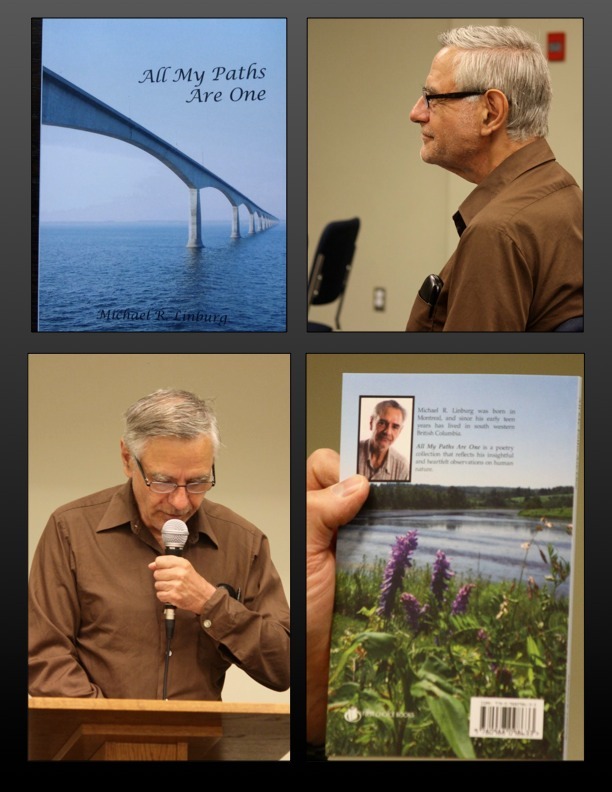 Michael Linburg launched his new book All My Paths Are One. There were new faces to meet and greet (always a happy sign). Poetry readings were many and varied, with the original theme of summer, then a second reading of whatever was available. In brief, a good time was had by all with lots of drinks and cookies etc. Though we will be taking a break from formal readings for July and August, FVPS will be part of the Abbotsford Arts Council Meet and Mingle in the Park event on June 27th (Mill Lake Park near Kariton Gallery on Ware St.) – 2:00 – 7:30 p.m.
Come by, say hello (we’ll have our own clearly marked table), and if you’re around between 2:30 – 2:50, you might just hear some of us read as part of the afternoon’s entertainment. 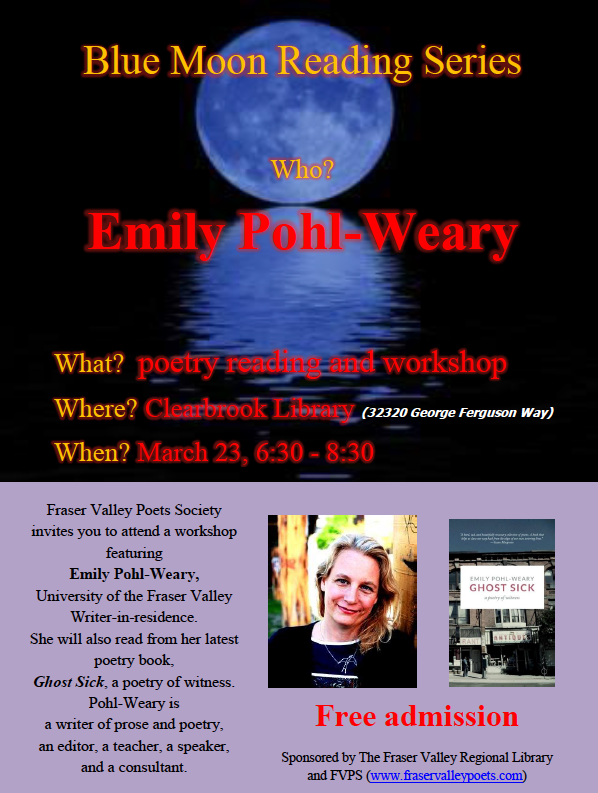 For more photos of Monday’s reading and to keep informed about all FVPS events, check out FRASER VALLEY POETS SOCIETY on Facebook. 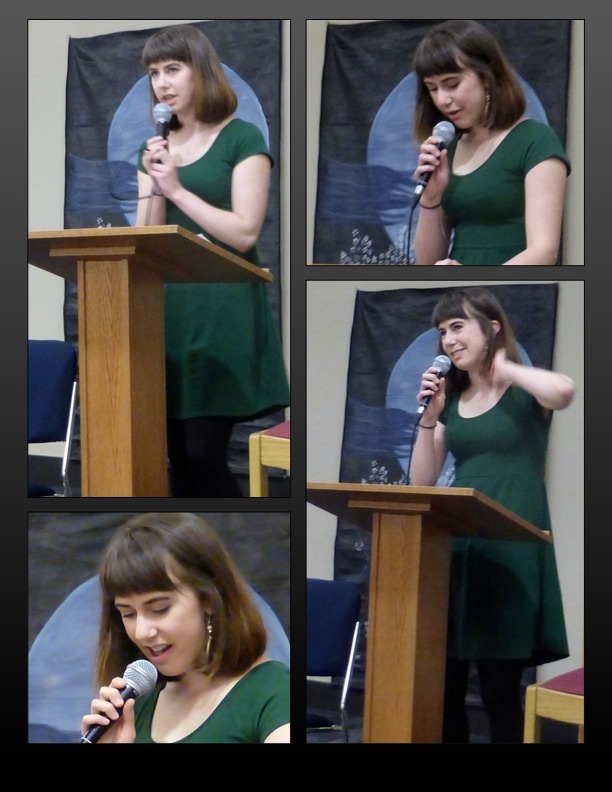 The Monday, May 4th Blue Moon Reading held a triple treat for all who attended. Three young poets shared their work in 15 minute segments that many of us wished would go on longer. Olivia Sharpe was the first of our guest readers. Her existential poems were full of interesting and original imagery that linked nature to memories of childhood, school, and her present life. There was hope. There was love. There was self-acceptance, family and a broccoli farm. Her pleasing image of faithless clouds contrasted to the faithful sun is still floating around in my head many days later. Thank you, Olivia, for sharing yourself and your poems with us! Mackenzie Lee, our second reader, read poems on the theme of seasons. Her poem about the library contained fabulous lines and certainly warmed the cockles of this bibliophile’s heart. She also has keen senses when it comes to nature, sharing poems about wind, water and light, and bringing people and relationships into them with skill and originality. 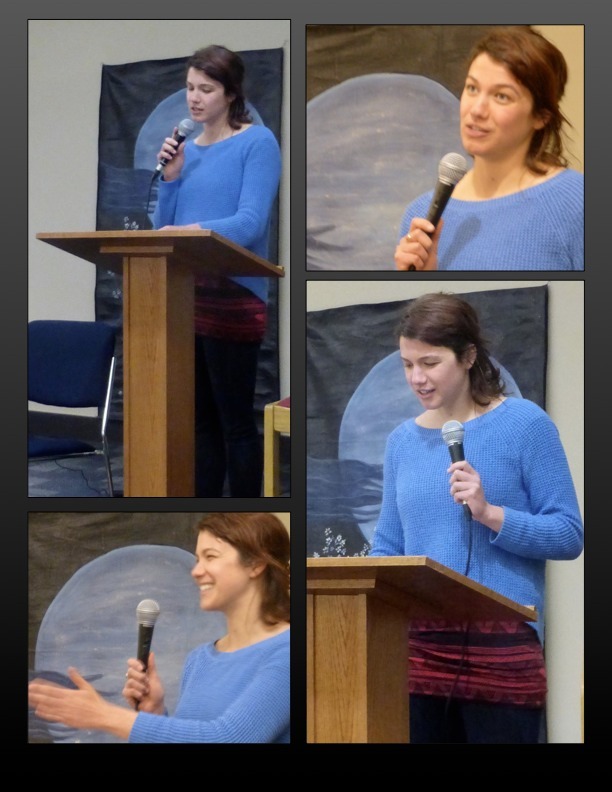 Thank you, Mackenzie, for your most enjoyable presentation! Open mic readings were sprinkled between the guest readings. We enjoyed the usual variety that included a light poem about a lobster by Ted, poems about his father by Alvin, a poem in the voice of a resident of a senior’s complex by Terry, a couple of poems read from A Familiar Shore by Emily, a poem in memory of Rinelle Harper by Shelley—and many more! Our final reader, Adriel Brandt was definitely icing on the cake. He read poems of nature and to nature. I don’t think I’ll ever look at a crow the same way after hearing his three-part ode to this evil, versus mysterious, versus magical bird. He also shared a poem about a library (I’m sure I saw our host room glow) and capped off his reading with a spoken-word-type performance of “I’ve got time” (well, I’m not sure that’s what it was called, but the line “I’ve got time” kept recurring). Thank you, Adriel for your stellar reading and performance! 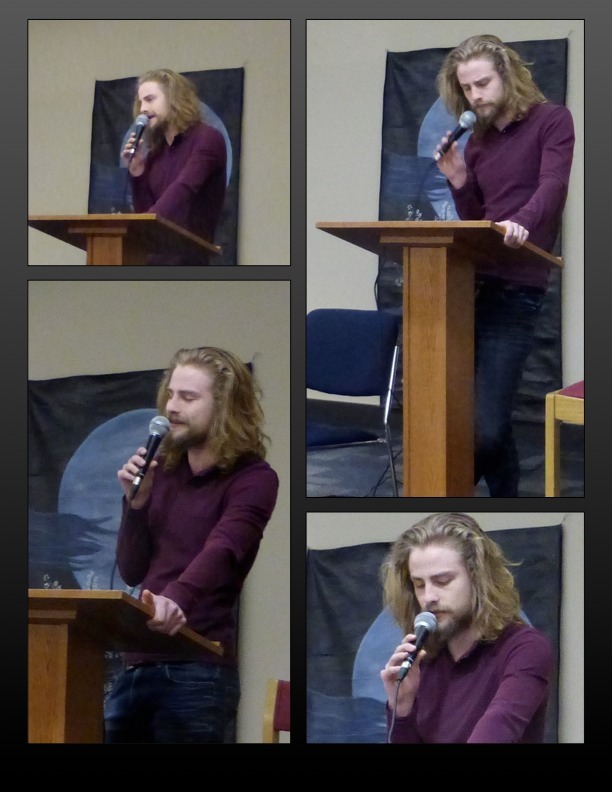 June 15 – 6:30-8:30 p.m.
President Brayden Sawatzky began our April 13th reading by recognizing the achievements of two members. 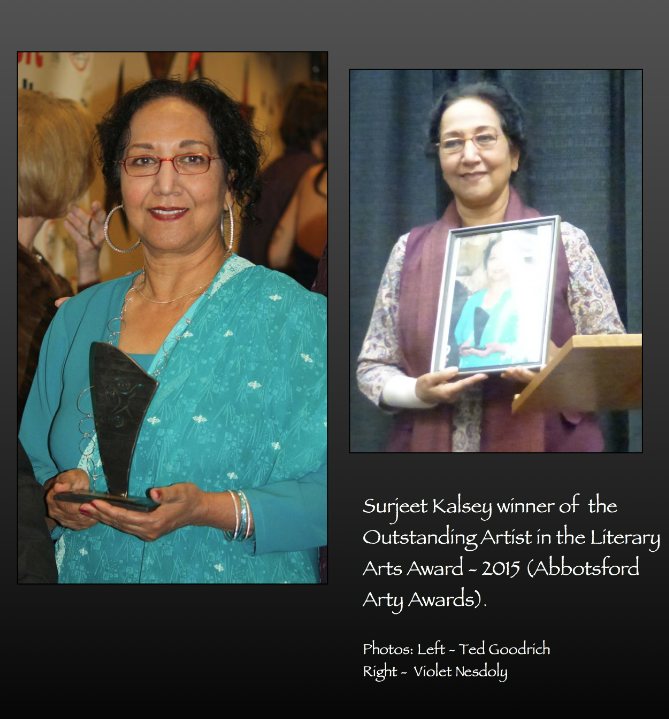 Emily Isaacson and Surjeet Kalsey were both honoured at Abbotsford’s recent Arty Awards. Emily Isaacson was nominated for the Christine Caldwell Outstanding Arts Advocate and Surjeet Kalsey won the award for Outstanding Artist in the Literary Arts. Ted Goodrich presented Surjeet with a framed portrait, photographed during the award night celebrations. 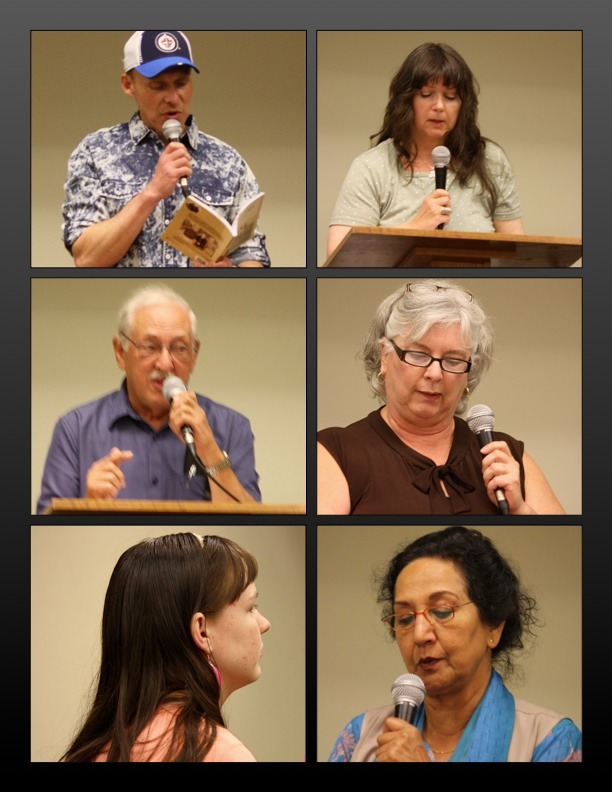 The Blue Moon Reading portion of the evening featured the anthology Borrowed Gardens. Violet Nesdoly was the featured reader. 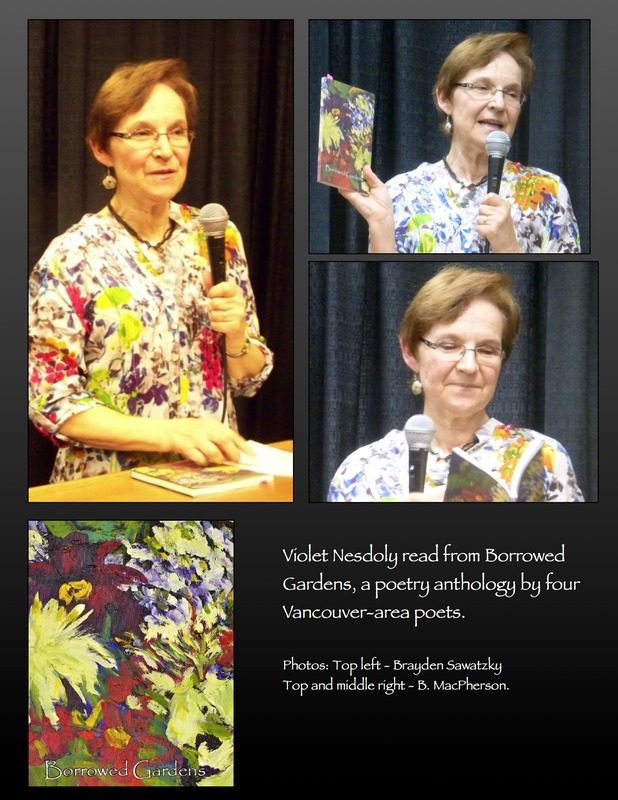 She read from all four sections of the book—poems by three Vancouver area women (Jeannine Bertoia, Del McNulty, and Tracie Fisher)—as well as a few poems of her own. 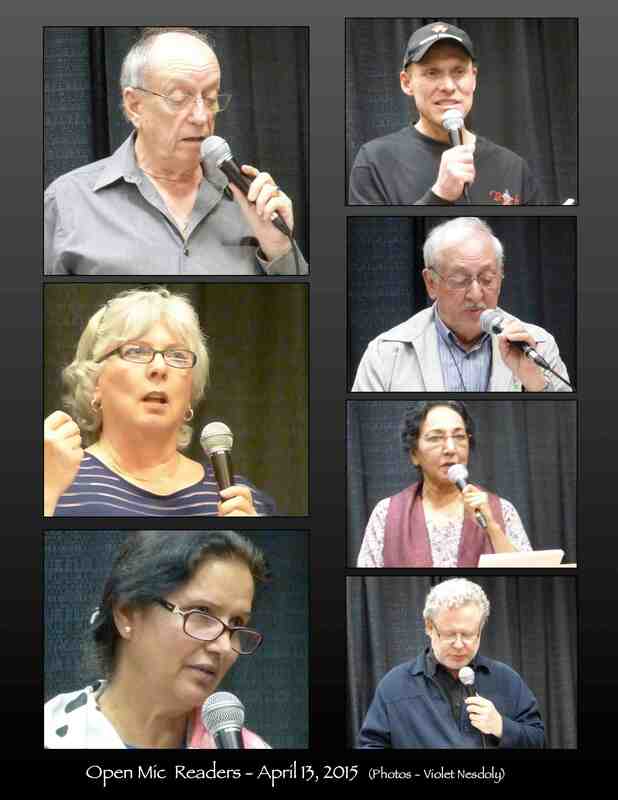 The always welcome time of refreshment was followed by an open mic where seven poets read their work—poems that ranged from sea fantasies, to memories of working in a nursing home and studies of interesting characters. Thanks to all who came out and made this a fun and memorable evening! Our next Blue Moon Reading is just around the corner. Mark your calendars for May 4th, when three guests Adriel Brandt, Mackenzie Lee and Olivia Sharpe will share their poetry with us. All are welcome to attend this FREE POETRY READING and OPEN MIC. 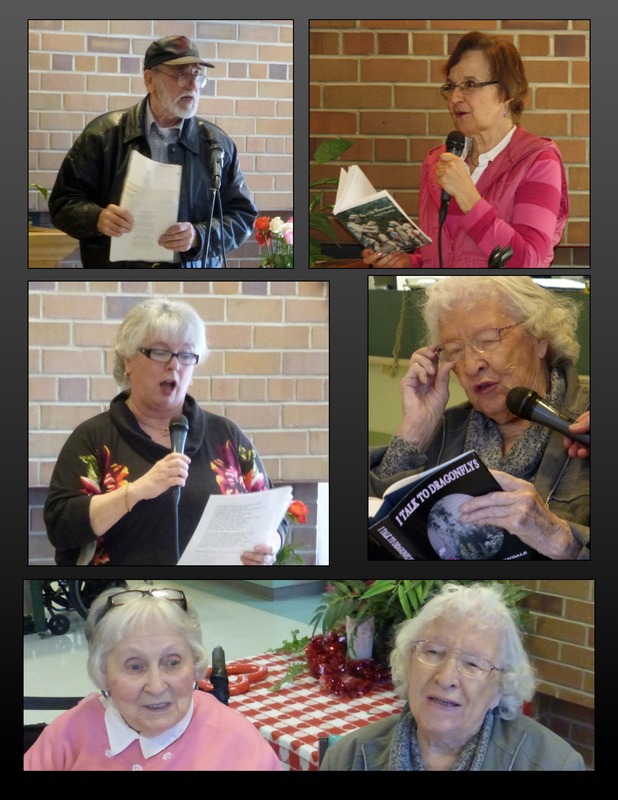 On February 28th, nine Fraser Valley Poets Society members gathered with residents and outside guests at the Cottage (a Fraser Health complex in Abbotsford) to enjoy a shared love of poetry. 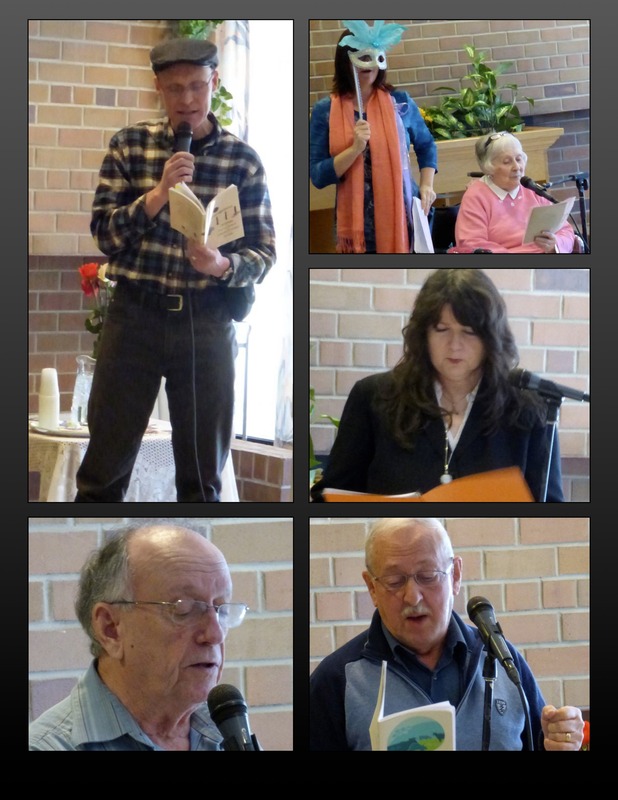 Poetry Society members and residents took turns reading to the crowd. We heard original poetry as well as old favourites. It was a wonderful hour of sharing words and friendship. A big thanks to Terry Broadworth who organized the program and was our MC for the morning. Two days later, on Monday, March 2nd, we gathered again to officially get our reading year underway with an Open Mic evening. The whole evening was given to reading our work. We circled the table at least three times. It was especially gratifying to welcome some new poets to the reading. It was a good start and we’re looking forward to a great year of Blue Moon readings and open mics.